SCS Software's blog: ETS2 Update 1.26 Is Now Live! 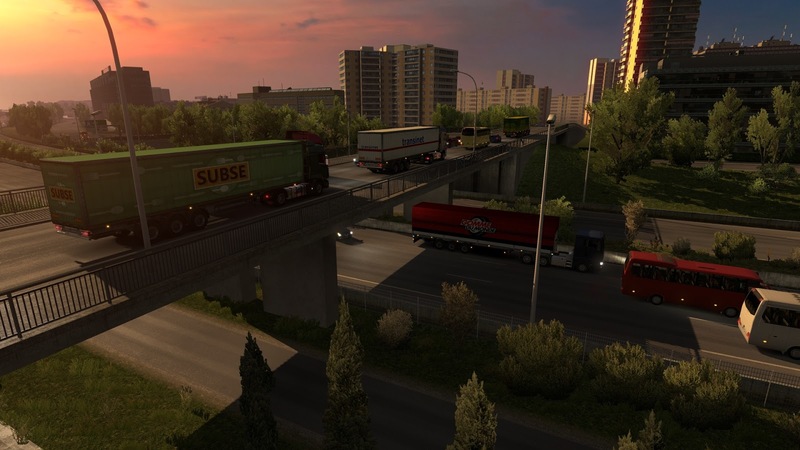 If you participated in the Open Beta on Steam, please don't forget to switch back to the non-beta branch in ETS2 properties. We have already covered the changes and improvements coming with this update extensively, in the post annoucing the Open Beta, but let's review them again so that you have all the news in one scoop. The main star of this map refresh is the city of Paris, which actually has been completely rebuilt to make it way more elaborate than before! We have re-touched the existing region of northern France in the base game. It's not a total rework from scratch, but we believe that you will appreciate some very visible changes in the world; new models, new intersections and use of higher resolution textures in many places. We have adjusted and added some new options for the transmissions of all the trucks tractors in the game, so now there are more options to choose - from the standard or overdrive style of transmissions or even the Allison 4500. We hope that especially the players who care for more choices and precision of the vehicle simulation will appreciate the new adjustment, now there are new opportunities to play with the ratio between engine and wheels. A new search line was added into the game's upgrade shop and truck browser screens, so now you will be able to look up for example a specific paintjob or a particular engine upgrade. This new feature will come handy if you own a lot of our minor DLCs or if you happen to have lots of truck tuning mods installed.